The most affordable city in the U.S.? 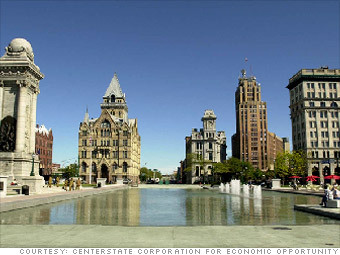 Syracuse, N.Y., (above) which ousted Indianapolis for the title. That city had been "most affordable city to buy a house" for five years. Their Housing Affordability Index inched up in the three months ended June 30, with 72.3 % of all homes sold nationwide being considered affordable for families earning the median income of $64,400. The NAHB judges a home to be affordable if a family making the metro area's median income could devote no more than 28% of their take-home pay toward housing costs. Before housing markets nose-dived after the mortgage crisis hit, the index rarely hit 67% in its nearly 20-year history and never exceeded 70% until 2009. That means, for homebuyers, these are the good old days, the best times in a generation to purchase a home. Here's a look at the five most affordable major markets and five others where homebuying is more of a challenge. NEXT: First place: Syracuse, N.Y.